Lono’s teachings are in honor of those who came before us. His songs are of Molokai’s sacred sights, history, animal traditions, the winds of the different districts, it’s high chiefs, the children, the paniolo’s (cowboys) and the people of Moloka’i. “It is but a fleeting glimpse for us to see the things our ancestors had to encounter and overcome to leave us the paradise we live in today.” Lono will be teaching true Hawaiian ukulele traditions and pack the music with stories (mo’olelo) of Molokai’s past from 600 AD, to the present. 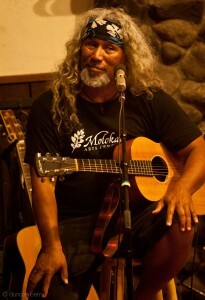 Lono and his friends will also share an ancient presentation of Moloka’i hula and their stories. Heidi Swedberg and Daniel Ward believe in the power of social music and the important place the ukulele has in bringing people together. They love to travel the world, performing and teaching all ages how to play and sing in harmony. Heidi, who was born in Hawaii, has been playing ukulele since age 5. Daniel’s unique style, which incorporates flamenco and classical techniques as well as rocking riffs, comes from a 30-year career as a versatile guitarist. As teachers, they bring passion and humor to the classroom, as well as the ability to break down complicated concepts and techniques into simple steps that enable players of all levels to enjoy making music. 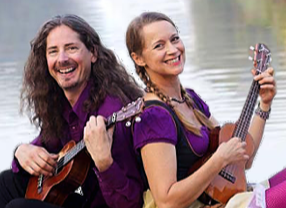 Both Daniel and Heidi write regularly for Ukulele Magazine, and enjoy learning more about the ever-expanding world of ukulele. 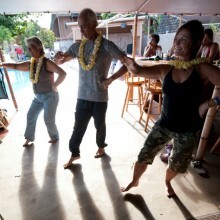 “HUI O MELE NEI” will be helping the group with the morning classes, afternoon hula and evening Kanikapila.